Does Something Smell? Then You Might Need to try Bac Out! I ran out of Bac Out about a month ago. I thought I would try to make a go without it. But I have to be honest, I missed my spray bottle of Bac Out. I love using it on our cloth diapers. But I also love using it on our other stinky laundry (hubby’s socks for instance) and other places all over the house. In particular, I noticed a smell coming from Sophia’s car seat that Bac Out would have been perfect for! But with no bottle of Bac Out I was lost. I broke down and got a new bottle yesterday. And I am so happy I did. Could I live without it…sure…but why would I want to? OK, what is it you ask? Bac Out is a stain and odor remover that uses live enzyme cultures and lime extract. The live enzyme cultures actually break down or ‘eat’ stains, odors and organic waste (poop and pee in this case!) The lime extract destroys the odors. This is a natural cleaner and completely safe to use around kids and pets. Two things I always say I love that Bac Out lives up to: when a product can multitask and when it’s made in the USA! This stuff is AWESOME for cloth diapers for a few reasons. First, it gets stink out!! If you have a problem with diapers smelling either out of the wash or once they are peed in…try Bac Out. Autumn did a great video on how she used Bac Out, click here to check it out. As for myself, I sometimes squirt a few sprays directly on a soiled diaper (after removing poo) before I place in wetbag. If I want to hit my cloth diapers with a big punch, I also add this to the pre-rinse. You should use about 1/4 cup of Bac Out on the highest water setting. So that is about 3 squirts around the inside of the drum or approximately 30 sprays from the spray version. Always run a full wash cycle (Hot Wash, rinse, extra HOT rinse) to make sure all the enzymes are removed. If this isn’t rinsed fully, the live enzymes could attack baby’s skin when they go potty in their diapers and cause a rash. If you are rinsing properly you shouldn’t have any problems. As for my smelly car seat I mentioned earlier; cleaned it with a little soap and water and then sprayed Bac Out all over it. Smells as fresh as a spring day now. Whatever had gone and died in it doesn’t smell anymore! My mom spilled her whole mug of coffee in her car. The milk trapped in the carpet started to STINK …sprayed some Bac Out on it…GONE! Bac Out is also amazing at removing stains and odors from pet accidents on rugs and furniture. You get the point. It has many uses. Many natural health and food stores carry it. You can also purchase Bac Out on Amazon. Some manufacturers recommend against the use of enzyme cleaners on diapers. 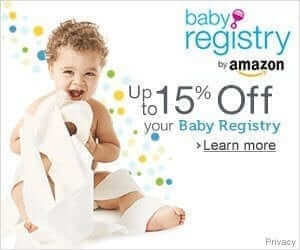 Autumn did a post a while back called: Will Bac Out Void Your Cloth Diaper Warranty? I am not sure if any of the manufacturers have changed their recommendations since. If you are worried about your warranty, check with the company first. 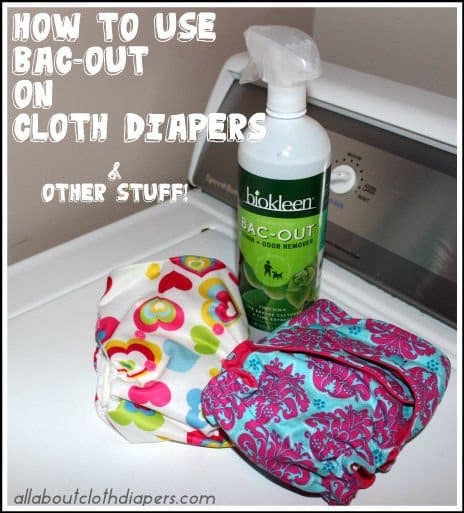 Have you ever used Bac Out on your cloth diapers? Or maybe something else? How well did it work for you? Make a Buncha Farmers Pretreater Spray… This is the BEST Cloth Diaper Stain Remover! The disclaimer that says EWG is giving this product a D rating is out of date. As of 10-9-18 the EWG rating is a B for this product. So, I’m not sure if that means the formulation changed again or if EWG changed how it was being rated. But I am ultra careful with cleaning products and trust this product. I don’t have human kids only Fur kids and was trying to figure out how to use this in the laundry from a pet accident and found this site which made me concerned at first and so I double checked and still feel this is a substantially safer product than lots of other cleaning products and especially carpet cleaners. Thank you! I updated it! I can’t buy Bac Out Localy and wasn’t happy with the prices I found online (shipping to Canada was the biggest cost) so I looked for an alternative and ended up with Out Pet Spray, another bacterial enzyme cleaner designed to deal with cat urine. It was $7 at Walmart vs the near $30 the Bac Out was going to cost so I gave it a try. I called the 800 number on the bottle before using and was cautioned against spraying it on the diapers and told to add to the wash instead. I figured they have to be careful when talking about using a product other than for its intended purchase added a rinse to my routine and haven’t looked back. Diapers used to stink the whole house up now the pail smells pleasant. They used to smell vaguely like a baked turd when warm from the dryer no matter what I did with my routine bit now they come out smelling of nothing. I would like to try Bac Out still but I think I found a similar product that works. That is very resourceful of you Megan. I’m glad you found something that works and that you can find. I make my own with “fermented” citrus scraps and I use it in every load! Hi Suzie! I’ve used it on smelly shoes, soaks, towels that had a mildew smell, pet accidents, spilled smelly milk on the carpet in the car. Literally any stain or smell you can try it on! Is Bac-Out “hard” on cloth diapers? Currently, I bleach about once a month to keep the smell and stains at bay. But I hate that bleach is so hard on my diapers. (Mainly GMD prefolds and AIO Simplex plus a few night diapers.) 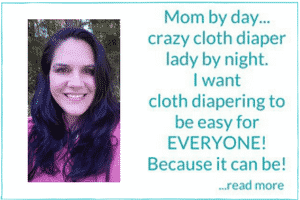 I use only natural fiber diapers… Does Bac-Out reduce the life of diapers too? I always thought that smells were due to bacteria (even though I have a great wash routine!) and so I thought that bleach was the ONLY way to truly fix the problem. It’s been a year and I’ve never had a yeast rash – so bleach is just for smells and stains at my house. Also… a little off topic, but have you ever come across the orange “mold” on the seams of your cloth diapers and inserts? It’s not really mold (I don’t think) but little orange spots that seem to appear along the seams of my prefolds and some inserts. Really bothers me since I don’t know what it is. I bleach for this too. I think the Bac Out is alot easier on cloth diapers than bleach is. Bleach is quite corrosive. Bac out shouldn’t break anything down as bleach might over time. Usually orange anything on clothing indicates mineral deposits from very hard water. You might try RLR for that, it would probably do better than the bleach to remove. it. Which do you recommend, foaming action or with live enzymes? Foaming action is simply the sprayer at work. Both contain live enzymes and are the exact same formulation I believe. I’m a Bac-Out believer! I LOVE the stuff. It works so well all around the house. Have stinky shoes? Spray Bac-Out in them. Child vomit on your carpet? Spray Bac-Out on it. Husband’s stinky sports gear bag? Spray some Bac-Out on the gear. Stinky diapers? Yup, you guessed it, we spray Bac-Out on them and soak laundry with organic stains in it! We love that its safe to use around children and pets. I feel good using a product that is produced in a family-run, family-owned company that is ecologically minded. Using cold-water in their production is a smart, cost effective, eco-friendly way of producing a product that’s a HUGE winner in my books. The smell is great. Not over-powering, its fresh and doesn’t linger like its less than eco-friendly, artificially highly-scented counterparts that are out there. The citrus/lime smell is actually quite refreshing and very bearable, even for someone like me who is asthmatic and allergic to lots of perfumes and scents. We go beyond Bac-Out usage in our home. We also use their dish detergent, laundry powder, their multi-surface floor cleaner and their carpet/upholstery shampoo too! It all started though with the use of Bac-Out on our diapers at your recommendation Autumn and snowballed from there. I contacted their company with loads of questions before trying other products as I really wanted to see what their customer service was like and pick their brains about ingredients and usages. Oh, and did you know that if it accidentally gets frozen (when ordered in the winter and UPS delivers it to the back door and it sits all day long in sub-zero ND temperatures) that the enzymes are not destroyed? Yup, a great product all around. Love it bunches! Thanks Autumn for the introduction to Biokleen. It is awesome stuff isn’t it?! Thanks for sharing Michelle!